Myths surrounding cats and FIV continue, resulting in fewer adoptions. Our FIV+ former feral Domino is a happy, healthy cat and we never worry about him infecting our other cats. Myths or public misinformation can only change with education. Our regular Vet 101 contributor Dr. Letrisa Miller recently attended the Feline Medicine Symposium at Cornell and shares her update on FIV. Look for our exclusive Q & A with her next week. FIV: feline immunodeficiency virus was first recognized in 1968 in the United States, although it has probably been present for much longer. FIV belongs to a family of viruses called “lentivirus,” which also includes the feline leukemia virus (FeLV) and the less well-known feline syncytial-forming virus (FeSFV). FIV, although frequently described as the feline version of HIV or AIDS, is not the same disease and is not dangerous to human beings. Like many viruses, FIV is found in several strains, each of which differs slightly from the other. One of the major differences is the severity of disease caused by the virus. Fortunately for the USA’s feline population, the strain of FIV most commonly found in North America causes less severe illness than strains found elsewhere. Even better, the reported rate of occurrence of FIV infection in much of the United States is low (3 out of a hundred cats or less). Many cats that are infected with the virus remain healthy for long periods of time and may never show any signs of illness from the virus. Those who do show illness tend to have problems with fighting infections because their immune systems do not respond well to infections and can’t effectively fight illnesses. This is called “acquired immunodeficiency syndrome.” Cats who do become ill as a result of the virus might experience chronic gingivitis, swollen lymph nodes, upper respiratory infections, chronic skin diseases, and/or chronic diarrhea. Some will show behavioral changes, and some will develop cancer related to the viral infection. The most commonly infected cats are free-roaming and feral (wild) cats. This is probably because the virus is spread by biting, and free-roaming cats are much more likely to fight. Free-roaming male cats are two to three times more likely to be infected than females. This is true of both un-neutered and neutered males because both tend to have larger territories than females, so they encounter more cats and fight more. Cats that live indoors with fewer than six feline housemates have almost no risk of getting FIV. For those who go outside or have more than six housemates the risk is still 3 percent or less. So, although the disease is out there, your cat is unlikely to become infected. if it has been in a fight with a cat whose FIV status is unknown. work with your veterinarian to avoid medications that might cause adverse reactions or increase the risk of FIV-related illness. An FIV vaccine is available but is not recommended for most house cats. Cats that have been vaccinated for FIV will test positive for the disease, and veterinarians have no reliable, inexpensive way to distinguish between cats that are infected and cats that have been vaccinated. Many municipal animal shelters routinely euthanize cats that test positive for FIV. How many of those cats might only have been vaccinated? Further weighing against the vaccine, it has an unclear effectiveness and is not made with the strain of virus most common in the United States. Until veterinarians have a reliable FIV test that can distinguish between vaccination and infection, the American Association of Feline Practitioners recommends not vaccinating against this disease. If your cat tests positive for FIV, you should have it retested six months after the initial test to confirm the original diagnosis and rule out the possibility of an earlier false-positive result (this is especially true of cats that were less than sixteen weeks’ old when they tested positive for FIV). It is also wise to have your cat tested the second time using a Western Blot-type of test for the best accuracy. While the tests done in veterinary offices is very sensitive, it can have false positive reactions. Take your cat to your veterinarian at least twice each year (twice annual health checks are actually a good idea for all cats). Discuss with your veterinarian which drugs should be avoided with your cat. Watch your cat closely for subtle signs of illness: changes in behavior, attitude, vocalization, appetite, and so on. Cats with FIV are special cats who will do best with owners who can closely monitor them for signs of illness and provide them with lots of love. In return, these owners will gain a loving pet who should provide years of amusement, affection, and companionship. Thank you so much for the wonderful post! I seriously appreciated it.I will make sure to take note of the page and will return from now on. I wish to encourage you to ultimately continue your fine job, even think about canon printer driver also, have a good afternoon! Now this is just what I consider an easy to follow posting. Very clear as well as the point. I will have to certainly watch out for more posts like this. Great topic, Layla, and timely for me. I just took in another feral cat. He tested negative last week (FeLV/FIV/HW) but now he’s in quarantine until we retest to verify. The only thing is, I get differing stories about when to retest. I’ve heard the 6 months you stated for positive results also listed for negatives! But then I’ve also been told 8 or 9 weeks (or 60 days). I believe 60 days is the most reasonable and that which is recommended by the AAFP. Thank you for this! 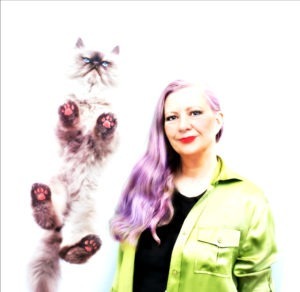 I always love reading articles that don’t paint FIV to be a horrific and terrible illness. One of my kitties is FIV+ (she was a stray I took in), and the first vet I took her too made the situation seem hopeless. Luckily, I found a better and more positive vet. However, Sassy is aggressive to my other cats and is a biter so she is having to be kept separate from the others. I am hoping that with some work that she will come around and be able to coexist with the rest of the gang! One of the six cats that used to live upstairs from the peeps had FIV. None of the others ever caught it. Life goes on and so do myths. Excellent information! Do you know that Dr. Miller is a finalist in the America’s Favorite Veterinarian contest? Vote for her! http://www.americasfavoriteveterinarian.org/finalists/2014-finalists/dr.-letrisa-miller/ She takes care of my “Boots” and is just wonderful – the best Vet I have ever worked with. ignorance and fear are still our worst enemies and it is very disturbing how much of both still exist in this “modern new age” world. Keep up the good work in educating and helping change perceptions!!! Well said! WE thank you for sharing this!!! We agree, great info and humans need to get over the fear. 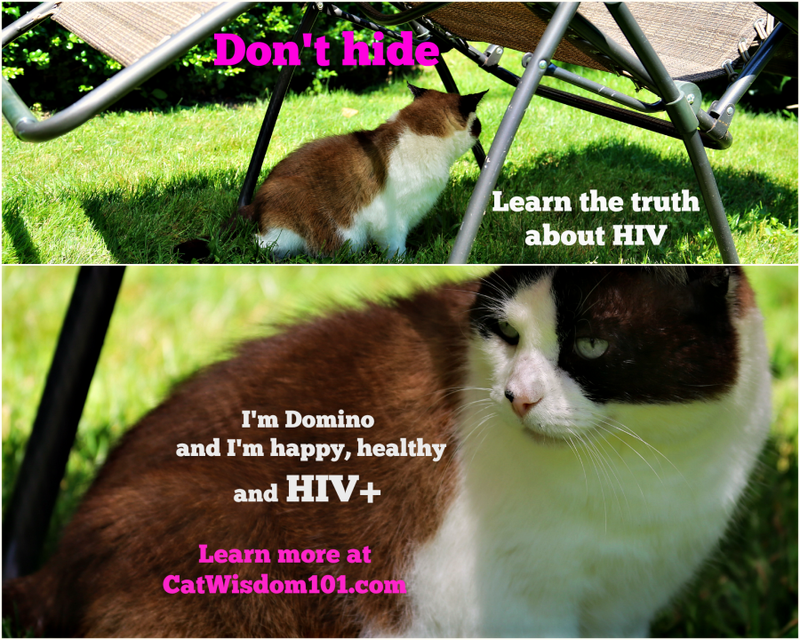 Part of the stigma wrongly attached to FIV+ cats is referring to them has having “kitty AIDS”, or HIV as is shown in your photos above. It would be fantastic if you could change that to FIV, instead of the incorrect HIV. They are not the same, and the reference to HIV is one of the things that scares people away from these cats. It also results in a lot of unnecessary deaths. Michelle, thanks for pointing out my editing error. It is corrected. Thank you for sharing this great information. It’s very sad FIV+ kitties are euthanized and terrible to think some of them might have only been vaccinated. Mom had an FIV+ kitty before we came to live here and she lived with two other kitties who never contracted it. But she was also a passive cat. It can be spread via cat bites, so living with an aggressive FIV+ cat is a danger to other cats. Yes, living with any aggressive cat which bites or breaks skin is an issue. Voted for your Dr. Shared your post. Very good information to get out to everyone. Thanks for a very important post. I had no clue that no vaccination is the better way. I hope once we will have a working treatment for this disease. Thanks for sharing this! We’re really sad that this got labeled “Feline AIDS” a while back and has scared so many people out of adopting wonderful cats. Information like this is what is needed to help people understand. This is really good information, Layla and Dr. Miller. Thank you for helping to st the facts straight about FIV! Such great info about FIV – I wish humans would stop making such a big deal out of this! Thank you for sharing Layla. This is good information to have.